Alpha is a practical introduction to the Christian faith. It is relaxed, non threatening, friendly and free. Over 2.5 million people in the UK have been on ALPHA. The Alpha course consists of a series of talks looking at topics such as 'Who is Jesus?' and 'Why and how do I pray?' After each talk we divide into small groups for a time of discussion. A typical Alpha evening involves a light meal followed by a talk from a DVD and then general discussion. It’s laid back, friendly, un-pressured (and free). There’s no need to commit to the whole course up front. 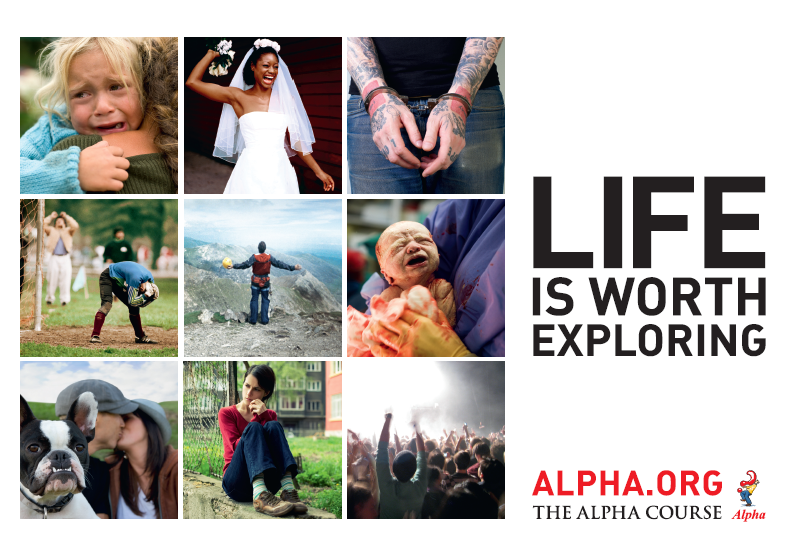 Over 2.5 million people in the UK and 17 million people worldwide have attended an Alpha course, running in tens of thousands of churches of all denominations across the world. Alpha’s relaxed format and content lead to enjoyable and stimulating evenings which can really impact our individual journeys of faith. Week 2 - Why did Jesus die? Week 3 - How can we have faith? Week 4 - Why and how should I pray? Week 5 - Why and how should I read the Bible? Week 6 and 7 - How does God guide us? and How can I resist evil? Week 8 - Why and how should I tell others? Week 9 - Does God heal today? Week 10 - What about the Church?